I've been quilting my mini for the Schnitzel and Boo Mini Quilt Swap and I'm loving it so far. That partially quilted section is where the bobbin ran out this morning! First I did stitch in the ditch around all the grey squares and the coloured triangles. Personally, I find stitch in the ditch to be boring work, though it does enhance the overall look of the quilt. I use my free motion foot rather than my walking foot and I'm finally getting better at it. There were fewer wobbles than there have been with past projects. Once that was done I could move on to the fun stuff! 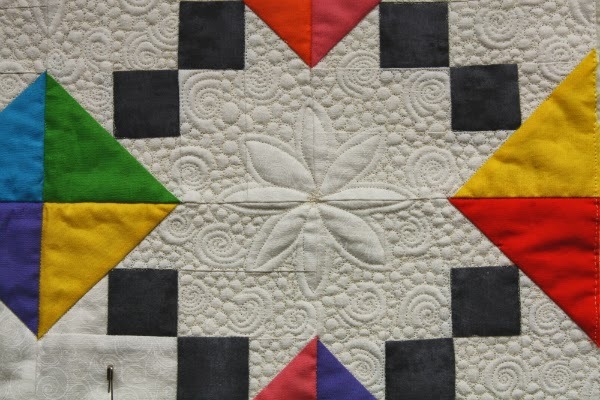 The flower in the middle of each white section is adapted from a picture on the cover of Judi Madsen's book Quilting Wide Open Spaces. I ordered a copy of the book (though it hasn't arrived yet) and the cover photos are gorgeous. The flower on the book has six petals, but mine looked better when I drew them with eight. I'm filling in around the flowers with pebbles and swirls and I'm thinking I'll leave the grey squares and coloured triangles unquilted so they pop against the more heavily quilted white. There are two half-blocks on each edge of the quilt, so they're all getting half-flowers as well. I sure hope my swap partner likes lots of quilting! Last night I had finished for the night, and had the quilt laying on the kitchen table so I could just look at it, when Paul came into the room. He asked if I wanted to make something else for my partner so we can just keep this one! Hmmm, no time for that, but now we're trying to decide what colours we want to use when I make one for us. Looks like there will be a fabric order in my near future. Oh darn! Are you interested in having me make you a special present? Check out my Craft It Forward post for details. Linking to Anything Goes Mondays. Also to WIP Wednesday and the new-to-me KISMIT at Modern Traditional Quilts. 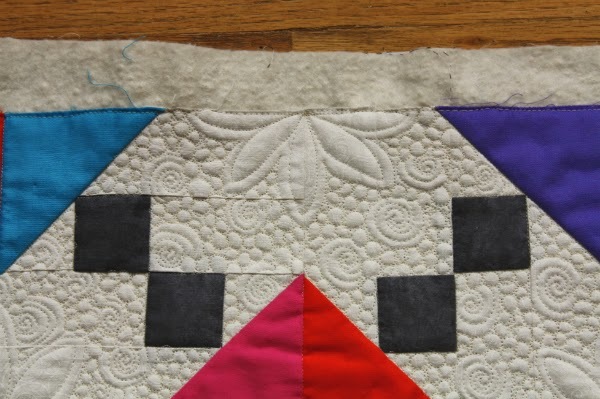 Great idea to leave the colored blocks unquilted to pop - the detail in your negative space looks great! Isn't is wonderful when your family loves a quilt so much that they want to keep it. A great excuse for more fabric. Your quilting is just beautiful!! That looks so effective...great job! I really love your combination of flower, swirls and pebbles. So beautiful! And I agree that leaving the color blocks unquilted make them stand out more. Gorgeous! I like your mini too! Love lots of quilting. Beautiful filler quilting as well. Your quilting really is beautiful. Absolutely beautiful quilting! I will link it to my blog so I can see it again and again. I am inspired. Oh my goodness! The time that takes and the attention to detail! I can't image someone wouldn't love it!!! I'd have a hard time parting with it myself! Very pretty! I like the colors and how you left those parts raised. I also like the swirls on the white swirled fabric. I'm with your husband, it would be hard to give away! Your quilting is incredible! Yes, it really makes those coloured sections pop! Thanks so much for sharing at the Let's Bee Social. I agree with everyone else, your quilting looks fabulous. Oh my gosh! Your quilting is AMAZING!!!!!! Tiny pebbles intimidate me. Perfect for a background, but you definitely have to be prepared to spend your time doing it right. Beautiful work! Thanks for the inspiration! This is gorgeous! I love heavy quilting....if I'm your partner. Lol. Such a beautiful mini! I can see why you'd be reluctant to give it away, so hooray for getting new fabric to make another one! 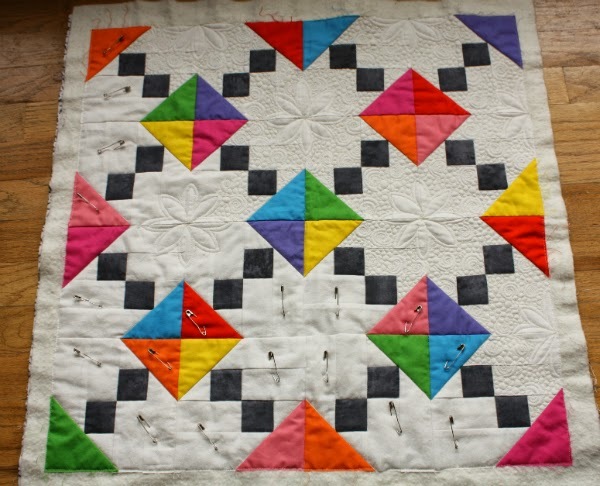 It would be great if you showed this quilt at my linky this weekend, Free Motion Mavericks. It's still early days yet, and I look forward to seeing you there. Gorgeous quilting you have done an amazing job! !